The lowest and most fundamental level of value is the value in your product or service. Features and benefits? Eh! Advantages? Eh! Make no mistake, it is important that you have a good product. A great product is even better. 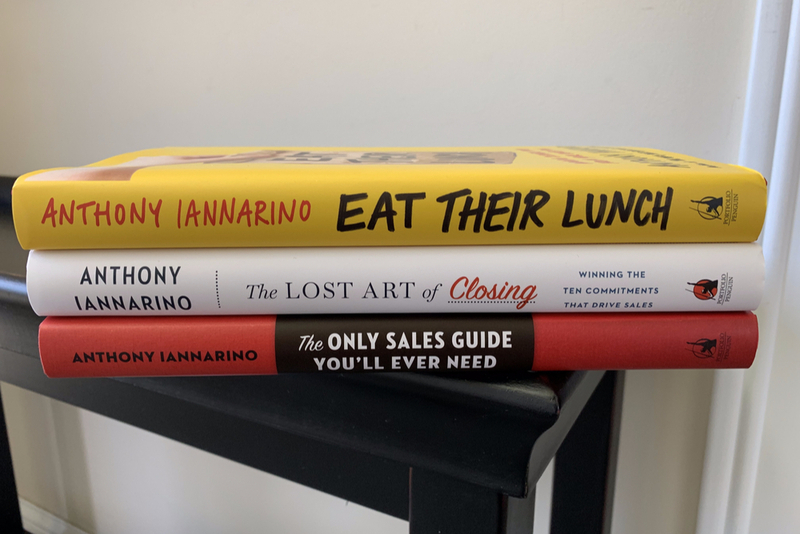 However, it is even more important to know that a great salesperson with an acceptable product beats a poor salesperson with an excellent product. 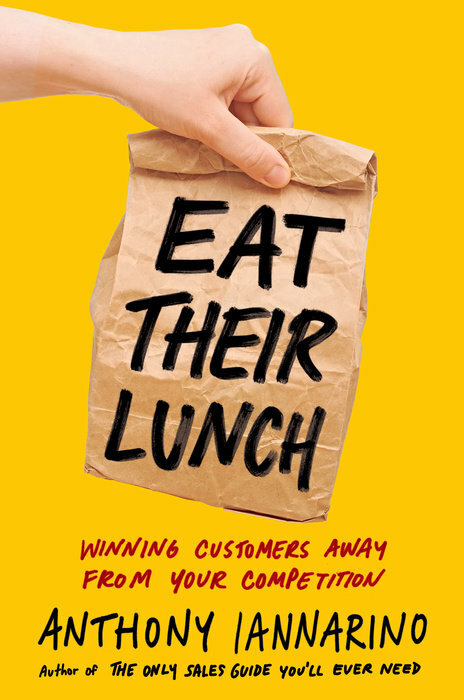 The challenge here is that there are so many good and acceptable products in competitive markets like yours that your product by itself isn’t differentiated or compelling enough to motivate a potential client to change partners. This is both why and how you’ve been commoditized. Staying at Level 1 is a recipe for losing clients. – Level 4 means that you have the business acumen and situational knowledge that allow you to create a strategic level of value. – It means you understand and can explain the dissonance that your dream client is experiencing; you can explain why they are struggling to produce the results they need and are challenged by their current circumstances. Can you align what you do with the needs of the people who are going to interact with you and your business on a regular basis? Can you quickly and effectively solve the problems that come with buying and using your product? 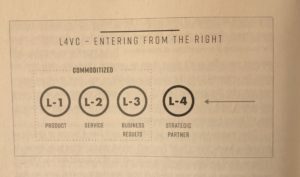 Level 2 (service) is greater than Level 1 (product). If your competitor is creating only Level 1 value, they are creating an opening for you to displace them. If their service and delivery failures are not being promptly and properly addressed, this higher level of value can create a compelling reason to change. 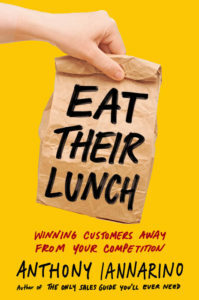 The costs of dealing with product failures compel people and companies to change every day. Level 2 is necessary; it allows you to solve product and service problems! Real-life example: Our architectural technical sales team (responsible for > $100m in revenues) conducted over 15 kaizen (continuous improvement) events last year alone, and has written nearly 60 standards of work. How’s that for process-driven? Our whole aim is to WOW our clients with A-level service while being easy to do business with. When we created this ATS team 2 years ago, our engineering submittals were taking nearly 8 days. Today, those are done on average in 2.3 days, with 65% of them done in less than 1 day due to our submittal generator. 2 years ago our tech support was taking nearly 5 day to get a response, and now more than 95% of them are answered within 1 day. Needless to say, I am extremely proud of our team’s accomplishments, but it is an ongoing pursuit of excellence to WOW the customer. 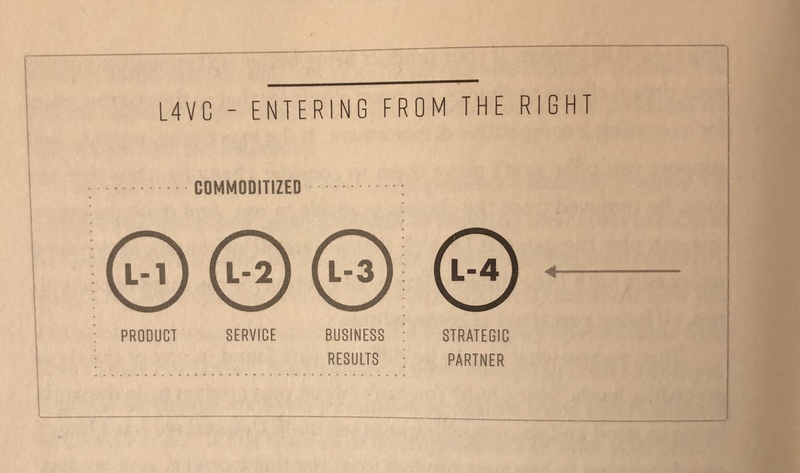 If you are in B2B sales, you are likely trying to operate and sell at Level 3. It’s not the product alone that you sell. Nor is it the service and support. Instead, you sell the business improvement that your product (Level 1) or service (Level 2) produces for your client. Problem is…. You are competing with others who also sell at Level 3. This is now the highest level of commoditization. Your competitor also has a spreadsheet that quantifies their value and their return on investment, as well as your clients purchasing department having a spreadsheet of their own to drop your prices into a couple of cells and determine who has the lowest price. When all things are equal, your dream client is right to make their decision on price. If there is nothing better available, they have no compelling reason to change. Scary, huh? You have no differentiation in the 3 levels. This is swimming in the red ocean. Like it or not, YOU are the largest part of the value proposition. If you are going to live in a red ocean, you want the largest fins and biggest teeth. 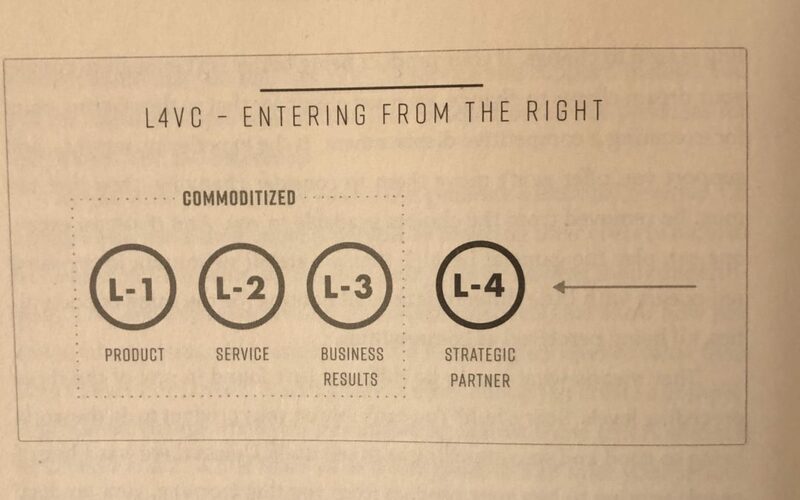 Level 4 is where you want to be and you want to enter from the right, not the left. Displacement requires strategic value + relationships. REAL-LIFE: One way our team drives cost savings for our customers is by palletizing in linear runs, so we get the right lighting products to the right floor of a building so contractors don’t have to scramble through box after box to find what they are looking for. Time is money and this saves the contractor $. We also use wireless controls with our NlightAir system, and wiring in some scenarios in which we use our Nlight system, which makes wiring an easy plug-n-play. This reduces labor charges upfront and on the back end, while reducing complexity. Level 1-3 are not advice. The features and benefits of a product won’t help you understand why you can no longer generate the results you need in a world of constant, accelerating, disruptive change. The services and support that create the experience of being easy to do business with don’t help you achieve your longer-term strategic goals and outcomes. The fact that you produce tangible business results, while being critically important, doesn’t help me understand what I need to do to deal with a future that will require me to make changes I haven’t yet considered. A long-term strategic partnership now requires someone who can occupy the role of trusted advisor and offer good counsel. This requires playing at Level 4. Level 4 means you have the business acumen and situational knowledge (ie. experience) that allows you to create a strategic level of value. It requires you to be super relational, not transactional. See past posts (over 13k views) in regards to this topic to further learn from others perspectives. I appreciate your comments and likes! Thanks to Anthony Iannarino, author of Eat Their Lunch.